Wallpaper adds warmth, character, and beauty to a room and also creates an astonishing variety of effects which changes the entire look and feel of a space. Wallpaper not only adds color to a room, but it can also create added interest and solve decorating dilemmas. Additionally, wallpaper can manipulate spaces, add or eliminate architectural detail, even be applied on objects besides walls, such as: shelves, headboards, accessories, etc! You can even have a custom-designed wallpaper printed with a pattern (or mural!) of your choosing. Like paint, wallpaper comes in countless grades and options to fit most every budgets and creative mind! Make an accent wall or small area “pop” with correctly chosen wallpaper! Use a pattern that complements the adjacent paint or stain to help “ground” and define a room. Visually separate a sleeping area from a sitting area of a master bedroom. Define a breakfast nook or eating area of a kitchen. Bring attention to an otherwise overlooked corner, divider, or wall. The right amount of wallpaper can make a big splash – too much wallpaper can date and crash! It is rarely advisable to wallpaper an entire room. In most instances, wallpaper works best when it has a reason for being, like setting the mood in an entryway or creating a theme in a bathroom or child’s room. Used well, wallpaper adds interest to a room without overpowering or dating it. Choosing Wallpaper: Stripes, patterns, colors, and feel are all important design methods that determine the mood and quality of an entire room! Use the same or similar color as that which is painted on adjoining walls to add subtle interest. Use contrasting colors for impact. Utilize textured paper to bring depth and opulence into a room. Choose bold patterns and/or colors to energize a room. Wallpaper that is textured provides level of interest that is difficult to attain with mere wall paint. It also provides many unique opportunities to reflect a desired atmosphere and personality for a room. Textured (also called embossed) wallpaper has a raised pattern. The designs available in textured wallpaper are vast … which means the design possibilities are endless! Adding texture to the walls gives your room an extra dimension. Wallpapers that have a raised surface promote touchy-feely warmth. Such styles make use of bamboo or woody fibres, lacy looks, perforated faux leather or coloured sand mix. Flocked papers often have a velvet texture, and embossed papers, such as those that emulate pressed tinned, can look very luxurious. There are also textured wallpapers that integrate pulped recycled products, such as wood, cardboard, paper, glass and plastic. Some textured wallpaper create an optical illusion whereas others have a soft, lovely feel to them. Some effects you can get with textured wallpaper even include the feel of natural materials such as, leather, timber, fabric, and more. These effects often cannot be replicated with paint! Some wallpapers are made of bamboo, grass weave, infused with metallic highlights, or made to look like stone or bricks. Sometimes it’s nice to add a bit of depth to a wall! 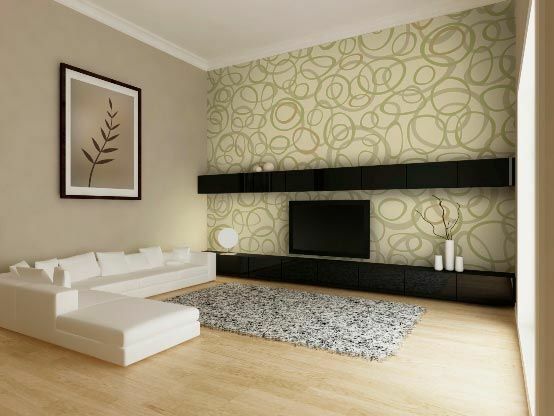 An added advantage of using textured wallpaper is that it will cover up any imperfections or oddities in your walls. If you want to add an unexpected, dramatic effect to a room, consider adding wallpaper (even better, textured or embossed wallpaper) to a ceiling! Textured paintable wallpapers have an embossed or textured design that resembles fine plasterwork! Anaglypta (Greek term for “raised ornament”) wallpaper is raised textured wallpaper designed to be painted. It’s great to use on ceilings to achieve a pressed metal look. Lincrusta is also a deeply embossed wall covering that offer an opulent finish with classic charm. Both of these most well-known types come in white which are painted after hanging. If this option appeals to you, be sure to read up on the pros and cons of its use. While it offers wonderful design opportunities, some brands have difficulty with long-term adhesion. Create visual interest in a room by adding wallpaper with a texture and/or pattern. Color and patterns set the mood of a room. They also provide the backdrops for carpets, furniture and accessories. Geometric Patterns include plaids, stripes and grids. Large geometric patterns add excitement and drama, while small patterns create a more subdued effect. Patterns with strong vertical lines can make a room feel taller. Large Prints add the most visual interest to a room. They can also make a room seem smaller and create a more intimate feel. Overall Print is repeated tight patterns. The eye blends the design together which minimizes the pattern and emphasizes the color. Small Prints add a touch of pattern on top of a background color and is best at forming a subtle backdrop. Mix Patterns Like a Pro. To create your own decorating scheme, keep these two simple pattern points in mind: Color & Scale. For instance: Typically, a larger room can handle bolder colors and larger patterns. The smaller the room, the more petite or delicate the decor should be. “White space” is a must! This is the space around and above furniture. A room rarely looks good when every inch of it is filled with colors and patterns, so be sure to allow the eyes “resting places” within the room. Scale: Use smaller prints and less of them in smaller rooms. A larger room can typically handle larger prints and more colors. If you have a small room but prefer a larger print, make sure it has lots of white space to balance the effect. Use repetitive patterns or colors. For example, if you have square-shaped wainscoting panels on your wall, choose a square coffee table and square patterns to maintain the same proportions throughout the room. Just be careful not to overdo it. • Border a mirror or window to give it visual importance. Extra wallpaper can be used to cover lampshades, pots, accessories, wood furniture, etc. – the only limit is your imagination! • Raise a low ceiling with vertical stripes. The upward lines makes the ceiling look higher. For an even more open look, keep the ceiling light-colored. • Lower a high ceiling with dark-colored wallpaper for a cozier feel. A wide border around the top edge of the wall with horizontal striped wallpaper is also effective. • Make a small room bigger with the use small and open patterns in light colors. • Make a small room look even bigger by matching the wallpaper and the fabric in the room. For instance, wallpaper a bedroom and pick curtains, bedspreads, pillows, and accents identical to the wallpaper while adding a solid color rug. • Make a large room more intimate with rich, dark, large patterns. • All-over patterns, extroverted textures and matte wallpaper camouflage bumpy walls and architectural oddities. • Add architectural interest with wallpapers that look like wood or by choosing mural wallpaper. • Wallpaper the inside of bookshelves to show off collections. • Metallic wallpapers add a little Hollywood glamor. New wallpapers are being embellished with glitter, glass beads, jewels, and iridescent or metallic inks and foils. Others have gritty glitter or sand on the surface or embellishments such as silver thread embroidery. • Before you begin, research which colors, shapes, textures, etc. best fit the purpose of the room. For instance, you’ll want to choose an invigorating design for a study or office, a tranquil design for a bedroom or bathroom, a stimulating design for a kitchen, a relaxing design for a lounge, playful design for a playroom, etc. • Build your décor around accent wallpaper. First choose the wallpaper you like for your accent wall then choose coordinating colors for the rest of the room based on color/s in the wallpaper. • If the wallpaper has a pattern, repeat the pattern in the room with accessories and add solid colors in the room that compliment the pattern. It’s all about the element of surprise that emerges when patterns, textures or materials are married. The design that results is an expression of your personal style and vision for the space you create.